Yesterday was a pretty good weather day - 80's, a breeze, not too humid. Today we have thunderstorms. We were supposed to go camping this weekend but it's looking like that is a no go as this rain is supposed to continue all weekend. As our friends with whom we camp said, a passing thunderstorm is one thing but who wants to put up a tent in the rain? Anyway, that same little voice that nagged me about the blueberries was after me about elderberries, too. The flowers had been so prevalent that there had to be tons of berries, the voice reasoned. And the voice was right. Yesterday I went back to my favorite elderberry shrub and the berries were ripe, plentiful and huge. I picked a whole bunch and came home and got them set up to extract the juice. I got about a quart of juice out of them. As I still have elderberry syrup and 1 jar of jam (of which I'm not fond because of the seeds) I decided jelly was the way to go. This morning I mixed the 4 cups of juice with a little over 1/4 cup of lemon juice, 5-1/2 cups of sugar and 1 package of powdered pectin and came out with 7 cups of elderberry jelly. It still has that slightly earthy taste which I like. Also this morning, I am pressure canning beans. I had about 4 quarts of string beans from the farm share and, as I already had dilly beans, I thought maybe pressure canning them might work. I don't really do a lot of vegetable canning this way, probably because I have an aversion to canned vegetables after eating a lot of elementary school lunches. Something about the metallic taste/smell, I think. Anyway, maybe glass jars are better? We'll see. Three quarts of beans, cold packed, are currently in the canner. Another thing I did yesterday was put a jar of sugar syrup (3 cups sugar, 3 cups water) into the hive in my hacked together feeder. I used a plastic take-out tray and some bamboo skewers, cut to fit, to make a base for the jar of syrup. Using a nail I poked tiny holes in the lid for the bees to sip from. The base holds the jar up so the bees can get underneath it to drink. I went to check on them at the end of the day and they'd taken about 1/4 cup, maybe more, of the syrup already. This way I can make more syrup and just swap out the jars and hopefully a little less often than what I was doing in the beginning. There is a product called Honey B Healthy that contains essential oils for the bees, I purchased the ingredients online and will start making some when they arrive. Apparently one adds about a teaspoon of this mix to each quart of syrup and it's good for them. 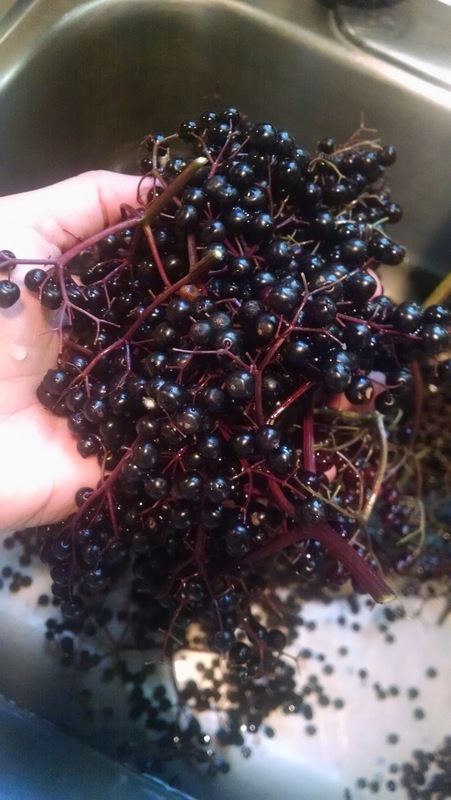 Love elderberry wine. Haven't look at any elderberries yet. Did up 11 pints of tomatoes today.